Wauwatosa East junior Chloe Tome plans on spending her time in college on the beach - when she's not in the classroom, of course. Tome (pronounced toe-me) won't be listening to music and sunbathing, but she will be playing beach volleyball. Tome is an outstanding volleyball player for the Red Raiders. She started as a freshman and earned honorable mention All-Greater Metro Conference honors. Then last season she was captain, Most Valuable Player, first-team All-GMC and honorable mention All-State and All-Area as an outside hitter. "When they told me (I was first-team all-conference) I was so excited," Tome recalled. "I was ecstatic. I had no idea. I never played to be first-team all-conference but it showed my hard work is paying off. They the All-State and All-Area honors came in and that was just really cool." But Tome spent a good portion of the summer playing beach volleyball and was successful at it. Chloe and her partner, Elizabeth Gregorski of Appleton Xavier, compiled a 17-1 record and finished second in USA Beach Volleyball Tournament. She also finished 11th out of 20 teams with Grace Manns of Fort Atkinson High School in August. And that is her goal after high school - attend college, receive a scholarship to play beach volleyball and study engineering or journalism. She has already made visits to schools in California and Florida. Playing beach volleyball has helped her indoor game. "Beach helps me so much; being in the sand is so deep, it's harder to move and jump," Chloe said. "So when I do come indoor my vertical increases. I'm so much faster and my hits are stronger because I can jump so much higher. "It really helps me with reading because there are two of you (in beach) and there is a lot more court to cover. So you have to be able to read (the court) or else you're never going to get there and it helps in indoor." 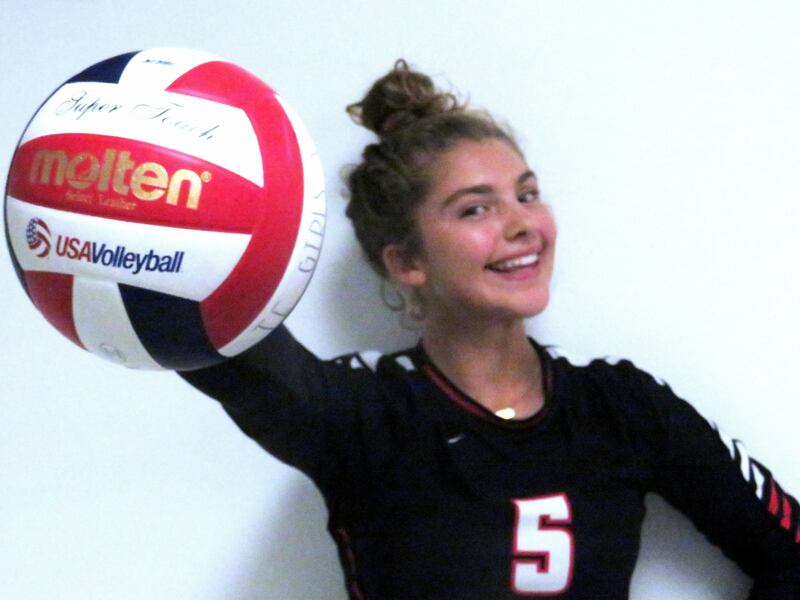 The fact that Chloe has had a successful path in volleyball is not surprising, since her father - and her coach - Gary Tome - was an All-American Club Volleyball play at the University of Wisconsin - La Crosse and he mom, Erica, was an outstanding basketball player. "I like that my dad played and me and my dad are really close," she said. "And my mom is really close. My mom played, but she was a really big basketball player, though. "I like the randomness of the game. You are never sitting, you are constantly moving. Anything can happen and upsets are so likely. It's so competitive and I love team sports. I don't like individual sports." Photo by Tom "Sky" Skibosh --- Junior outside hitter Chloe Tome was first-team all-conference and honorable mention all-state and all-area last year. Chloe got an early start in her career. "I've been involved ever since I can remember," she said. 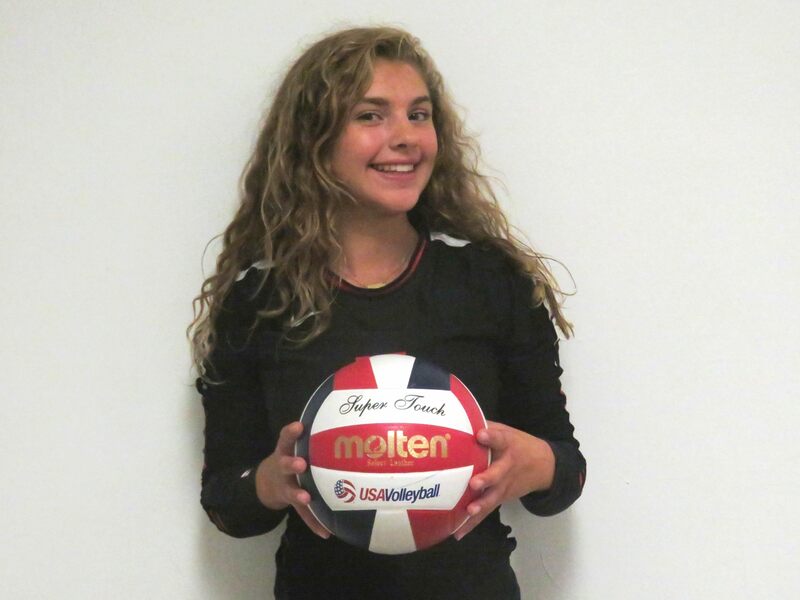 "I grew up in volleyball and I started playing when I was 5. My dad got me into it. After school (Longfellow) I started playing beach and then I started playing club when I was 11 until high school. Gary knew he had something special in Chloe at an early age. "Even when she was little she had a little different mindset on the court. She kind of had an edge," Gary said. "She played with a chip on her shoulder. She always wanted to take the big swing, always wanted to make the hard pass. "She had that energy, she was a real competitor. With all the teams she's played on she's had that fiery attitude. ever since she was little she's kind of had it." Chloe likes being the outside hitter. It's suits her game just fine. "I like being able to play defense and offense because I'm the one who can be able to terminate and put the ball away," she said. "I can also be the one to help set up the play and I can fix plays. "So I think that's a big strength - being able to read where the hit is going to go, get there before it goes down. So it's a really good all-around position. I enjoy that." She does want to improve her game, though. "I would like to get better at blocking because I get used too much," she said. "They (the opponents) hit it and it goes off my hands. If I was stronger blocking, I could get more. But I think I can grow that way. and in my overall game, just grow. Get physically stronger, smarter and watch video (of my game)." Photo by Tom "Sky" Skibosh --- An outstanding beach volleyball player, Chloe Tome finished second in a national tournament last summer. Gary also talked about Chloe's strengths and the areas she needs to get better at. "One of her biggest pluses is her competitiveness," Gary said. "I never have to say anything to her. She's just a competitor. Whether it's a mundane drill in practice or under the big lights. She has a good IQ and I can challenge her in different ways. "However, she needs to be a really cerebral hitter. It's up to her to become more of a dynamic athlete. She needs to keep getter stronger, getting more explosive." Chloe was then asked the million dollar question. What's it like to play for your dad. "I love it because I know I'm getting a good coach," she said. "I've had so many great coaches and I've learned something new from all of them. But my dad being there can always connect with me on more personal levels. "He knows me when I'm struggling or he knows my little hitches that I have to get out. He's coached me since I could walk. I have had other coaches for club, but he has been my official beach volleyball coach. "He's the one who brought me into the game so I train with him unofficially and he was my official indoor coach. He came here before my freshman year so he could coach me and my siblings (12-year old twins Max and Lilly). Chloe knows that her father won't play favorites. "I really like it because in our conference - which is a very tough conference and I know he is the one who will really push me and drive me to get me into college to play this sport. I know he is going to lead me there and challenge me. "It can be hard sometime with me playing and I'm his daughter. It makes me work harder to prove I'm not just playing because my dad's the coach. He's instilled this in me - 'If you slack, you won't play.' I really enjoy it." Gary, of course, has been asked the same question. "When she asked me if it was OK we do this, I told her she is just another kid," he said. "But I've showed her some 'tough love.' I expect more. "My feedback is the same. As a freshman she beat out seniors but I thought it was because she clearly established herself. It's been great. I get to see her everyday as opposed to coaching somewhere else where I never see her. It's exciting! I get the best seat in the house to coach everybody." FAVORITE MOVIE: 'Unbroken' - Humorous and Inspirational movies. MOST MEMORABLE MOMENT: Beating Tosa West before a packed house last year. WHAT DO YOU WANT TO DO IN THE FUTURE: Attend college, playing beach volleyball and studying Engineering or Journalism.